Holiday themed socks are great fun and they are becoming something of a holiday tradition in many families, so buying in some women’s wholesale holiday themed socks in plenty of time before the holidays is a must if you can’t to catch that holiday trade. We have a great selection of cheap wholesale women’s holiday socks for you, including women’s Halloween printed socks and Halloween knee high socks, and ladies Xmas socks and Christmas socks, and they are all available to you in single case quantities at the lowest wholesale prices. These fabulous women’s Christmas novelty socks and Halloween novelty socks are bound to popular and they make wonderful gifts, so you will definitely have no trouble at all selling these holiday themed socks, especially at these unbelievably low wholesale prices. Cheap wholesale women’s holiday socks are just one of the many wholesale seasonal items that can save big money on at All Time Trading, so don’t forget to check out our full range of low cost artificial Christmas trees, bulk discounted Christmas wreaths and our wonderful selection of Christmas candles at low wholesale prices. For Halloween, we also have a great range of bulk cases of Halloween door decorations, cheap wooden Halloween signs and heavily discounted bulk cases of Halloween tinsel wall plaques. Women’s Christmas socks and women’s Halloween socks are just one of the many wholesale holiday themed products that you will find at Alltimetrading.com. Like all the wholesale products that you will find at All time Trading, our wholesale holiday style socks for women are top quality products at low wholesale prices. We understand that your customers demand the best, even when they are buying women’s value holiday novelty socks, so we only stock the best quality wholesale products across our entire cheap wholesale range. 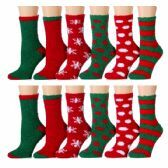 Low cost wholesale women’s holiday themed socks are fun items that will sit great in holiday themed retail display or a women’s socks section of a retail store. Put your low cost women’s holiday themed socks on prominent display, though, because Xmas socks and Halloween socks make the perfect impulse buy around the time of the holidays. Saving money on women’s Christmas socks and women’s Halloween socks is easy and you only have to purchase one single case. Take a good look around our women’s socks and pantyhose section, as well, though, because if you spend more than $499.99, shipping is free! All Time Trading is the premier supplier of wholesale everyday products. We have the largest range of cheap wholesale products at the lowest bulk discounted prices. 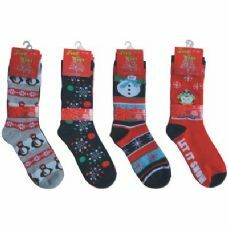 When you shop at Alltimetrading.com for seasonal holiday themed socks and other cheap wholesale products’, you are sure to get a bargain on every case that you buy. We are the best online wholesaler there is! We have women’s wholesale holiday themed socks at low bulk discounted prices, like Christmas socks and Halloween socks in stock right now, so don’t leave it too late! Order you’re your women’s holiday themed socks today and get ready for the seasonal rush!